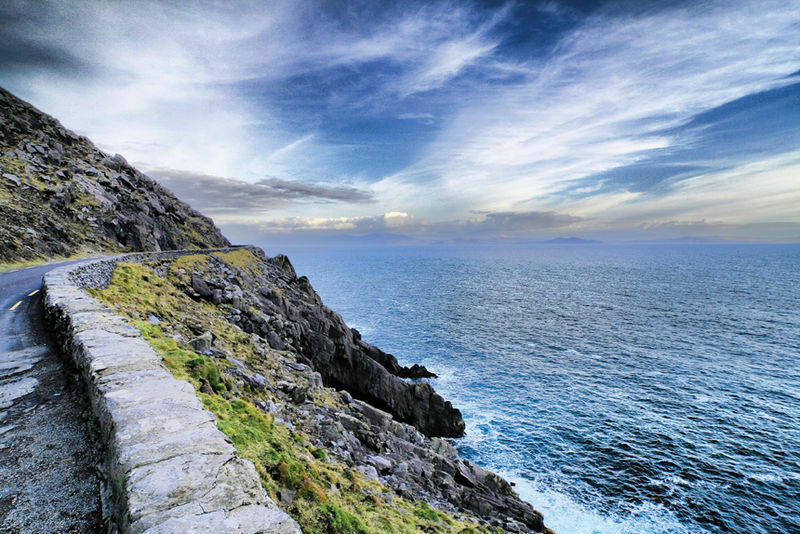 The Wild Atlantic Way is a 2500 km touring route that hugs Ireland’s west coast from Malin Head in the north to Mizen Head in the south taking in some of the most breath-taking scenery imaginable. It presents an epic journey that twists and turns around headlands, peninsulas, towns, villages and back roads. It is a land full of contrasts from the highest sea cliffs where the Atlantic Ocean is raging to secluded and calm sandy bays; from dark clouds and rain to beaming sunshine (it’s often said if you don’t like the weather in Ireland, wait a minute); from the people to the wildlife, from the food, music and craic to the scenery, there truly is something for everybody. At explorenorth we have experience in providing tours along the whole of the Wild Atlantic Way. We provide driver/guides and high-quality vehicles to deliver a first-class tour experience. We like nothing more than getting off the beaten track and taking you to the hidden gems along the Wild Atlantic Way, the places that maybe the bigger touring coaches don’t go. We are a small business but are big on customer service. We want you to enjoy your holiday and we like to be flexible and create itineraries inspired by your interests. We are primarily a transport service but we are happy to assist independent travellers, families or small groups with their itinerary. We can also help make recommendations and assist with accommodation requirements (hotels, B&B’s, self-catering), visitor attraction bookings, and golf tee times. We have a number of tour operators that we work closely with and we are happy to recommend these to you, if you want a bespoke tour itinerary created. The Wild Atlantic Way (www.wildatlanticway.com) is divided up into six regions. explorenorth are based in the area of the Northern Headlands in county Donegal, and we specialise in touring this region. See our range of day tours as an example of how we can combine these day tours into an itinerary to facilitate touring the whole region. We also offer tours of the Causeway Coast, Derry City and even Belfast if so desired. In 2017, National Geographic Traveller voted Donegal the ‘Coolest Place on the Planet for 2017’. Nothing to do with the temperature, I promise. But if you want to breathe in the freshest of air at Malin Head, see the Northern Lights dancing in the clear night skies, enjoy views across to the Western Isles of Scotland or just enjoy a more relaxed pace of life, then explorenorth Wild Atlantic Way tours may be what you need. Contact us today! Sligo is known as Yeats' Country in memory of poet W.B. Yeats. From Innisfree to Lissadell and onto Drumcliffe to the resting place of the great poet, this trip around Sligo and Leitrim is full of picture postcard scenes. 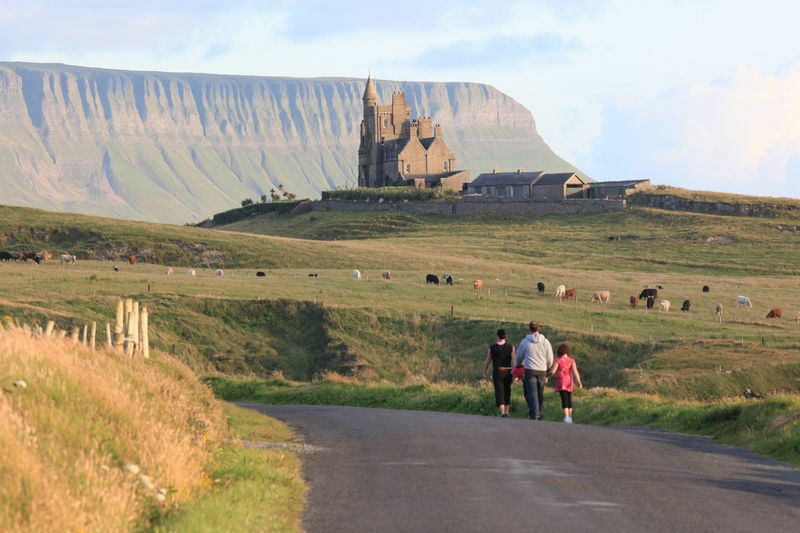 The coastal road at Mullaghmore is simply awe-inspiring - you’ll want to stop to photograph the impressive and gothic-looking Classiebawn Castle. A visit to Parke's Castle, a restored early 17th Century plantation castle on the tranquil shores of Lough Gill is well worth the effort. The road trip between Westport and Galway via Louisburgh (R335) and Doo Lough Valley is simply stunning. A small roadside memorial remembers local people who died from famine in 1849. The drive leads on to the village of Leenane, the location of the 1990 film 'The Field' starring Richard Harris, and the glacially carved inlet of Killary Harbour. 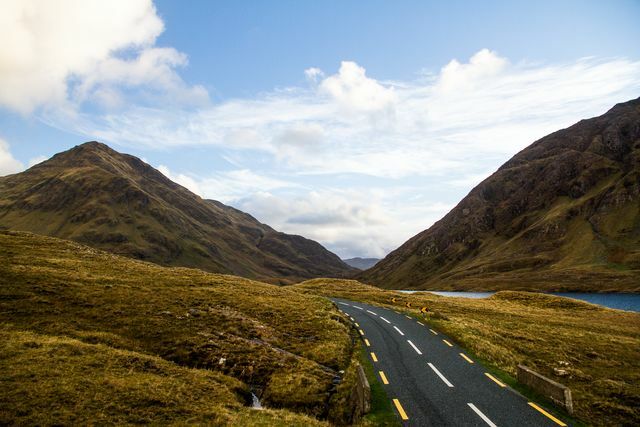 Driving through Connemara, Kylemore Abbey and Walled Garden, the home of the Benedictine Nuns, is mostly certainly worth a stop. Continuing on the N59, The aptly named Sky Road, a 15 km drive west of Clifden offers incredible views. 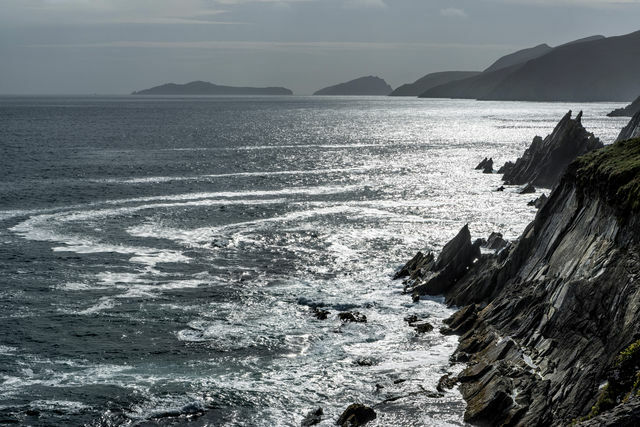 This half-day drive beginning in Dingle is without doubt one of the most stunning and jaw dropping tours on the island of Ireland. It is usually driven clockwise to avoid meeting any of the large coaches on the narrow roads. There are a number of fascinating places to visit on the way around if you can take your eyes away from the astonishing natural beauty offered on this scenic coastal drive. Beehive Huts or Clochans are an example of dwellings from the Pre-christian times, found at Fahan, near Ventry. The Blasket Centre tells the story of island life, subsistence fishing and farming on the Blasket Islands prior to the evacuation of the Island in 1953. Gallarus Oratory - One of the most famous landmarks on the Dingle Peninsula and situated close to Gallarus Castle. The Oratory is completely made of stone and in some way it resembles an upturned boat.